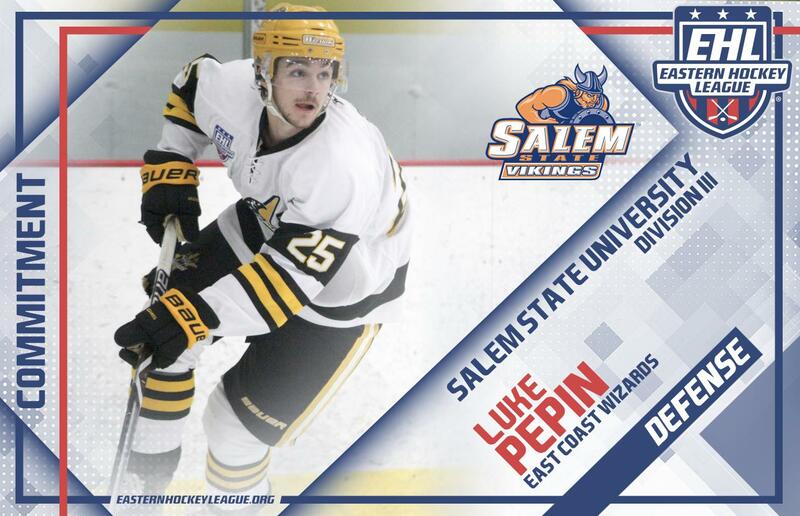 BEDFORD, MA -- The East Coast Wizards are pleased to announce that Luke Pepin has committed to Salem State University for the fall of 2019. In two seasons with the Wizards, the '99 native of Lee, NH tallied 53 points in 69 career games in the Eastern Hockey League (EHL). "Luke was our leader on the back end," said EHL head coach and general manager Freddy Meyer. "He is a tremendous skater, and does a phenomenal job carrying the puck up the ice. He's arguably one of the, if not the, best defenseman we've had suit up for our junior program. He will be greatly missed and very tough to replace, but Kory [Falite] and I look forward to following him at Salem State." Pepin is set to join a former teammate of his in Kevin Stoya, who played 24 games for the Wizards this past season (2017-18). The two defensemen became close friends during their time in Bedford, and Pepin is happy to have that comfort, as he heads to Salem State this fall. Looking back, the former EHL All-Star is also beyond grateful for his time in the league and with the Wizards, and he took a moment to show his appreciation. "I would like to thank my family, friends, past teammates, and past coaches for helping me reach this point, I wouldn’t be here without them," said Pepin. "I also would like to thank Freddy, Kory, and Adrian for everything they have done for me as hockey player and as person; they truly made this the best 2 years of my life not only on the ice, but off the ice too. I owe a lot to them for my development to get to college hockey." While the season ended soon then Pepin and his teammates had hoped, all of the Wizards should still be very proud of what they accomplished in the best year in franchise history. As the offseason now begins, be sure keep up on all things Wizards at ecwjrhockey.com or by searching #BringTheMagic on Facebook, Twitter, and Instagram.